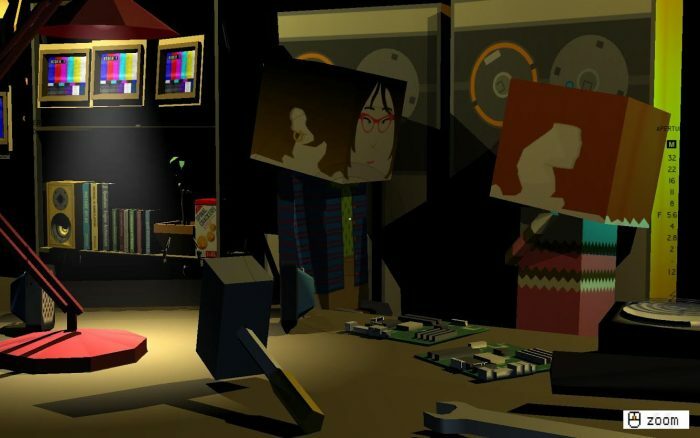 REVIEW: Quadrilateral Cowboy – PLAY! PLAY! When you have the ultimate hacking machine armed with a 56.6k modem and staggering 256k of RAM memory, it only means one thing: you answer only to the highest bidder! After the intro mission, the first thing you do in game is to physically make of the above-mentioned “beastly” hacking machine. You successfully start up the system on the new computer; load up your first serious hacking job. Then you meet on the field and get into action. 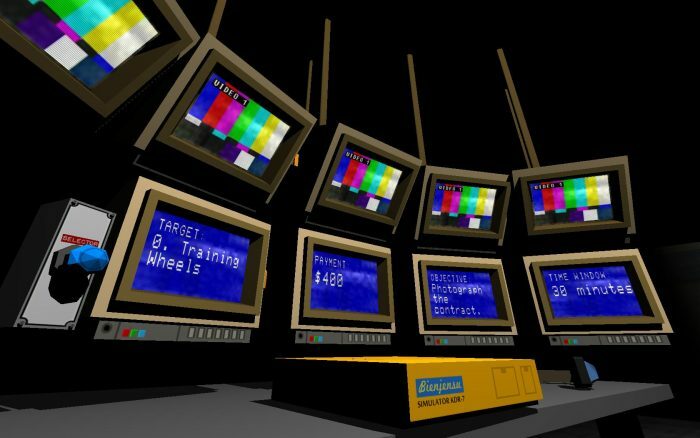 Your in-game computer is a retro-futuristic VR machine meant to simulate various “hacker jobs” that you’ll perform during the game. One can understand that you’re not “paid” for the execution of direct – true – hacking, rather you do a hacking simulation of the desired location and steal the desired object for your “employer”. If it turns out that you’re successful, you will get “paid” for the executed simulation. Although, actually you won’t even get paid, nor can you use the money “received” in game. 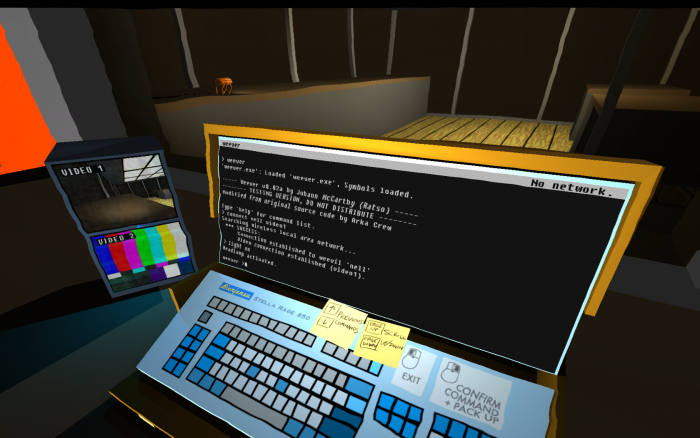 In fact, you actually play the game, which is actually a simulation of hacking, by entering commands at the terminal to execute various operations, and manage items in a VR simulation. But actually, you’re just a person who types in commands that are executed in simulation… Ah, I know it sounds complicated, but that’s what you get when you play a game that is Quadrilateral. 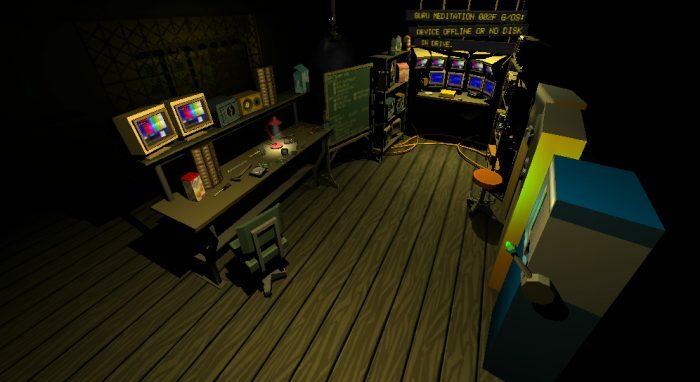 In fact, despite everything, this is a very nice adventure with solving “hacker” puzzles. If you thought that you will at least have the feeling of real hacking in game, like shutting down sites or cleaning out bank accounts, then don’t get too excited. 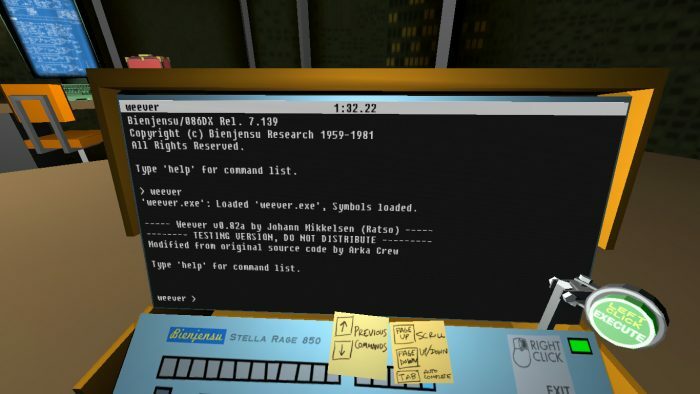 These are rudimentary commands that you type into a virtual terminal, which you use to manipulate different objects in your environment and control certain gadgets that you use to “solve” the level and reach a certain object. This game’s gameplay mostly resembles Talos Principle, but if it’s was toned down quite a bit. So, there is no hacking through some server to get access to certain data, money or something else. You are moving through virtual levels, encountering obstacles that are keeping you from the object – the thing that you need to get. 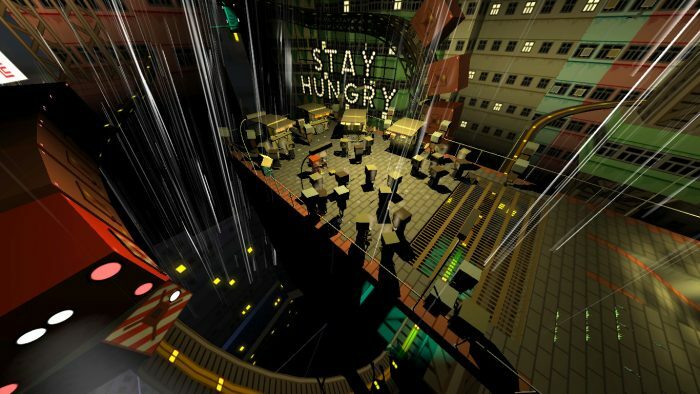 To defeat the level, you will use your computer to type desired commands to open, shut down or bypass obstacles. Commands are very basic and easy to learn, and the game doesn’t require knowledge of commands from a real terminal or, god-forbid, programming. For example, to open the door in game you first need to set up your virtual computer in the environment, access it and type door1.open(3), this will make the first door in the level open up for three seconds, after which it closes. If the door remains open for more than three seconds, the alarm will activate. This is immediately suggested when you enter each level in game. Also, cam(1).off(3) – will turn off the camera 1 in level for three seconds. For some reason, everything that stays open or shut down for more than three seconds will activate the alarm. In the beginning levels are simple and require execution of commands individually. Later, it will be expected from you to be a bit more creative and perform two or three commands in one line of the terminal, separated by command for waiting, wait(5). That way you will encounter situations in which you shut down the camera in order to circumvent the door it was monitoring, only to have to come back the same way you came with the object that you had to collect; these operations will require you to combine different commands that are executed one after the other with a wait period, because you can’t always carry your virtual terminal with you. Apart from manipulating objects in the level itself, you will also carry a few gadgets with you, such as a small mechanical robot that you can give commands to wirelessly, but before that you will need to establish a connection with it. He’s good for accessing parts of the level that are inaccessible to you, through which you can then execute the command to activate a certain switch in a far place, allowing you to go on. You can follow his movement through a small CRT screen through which you get his video signal. Beside him, in your arsenal of gadgets, you will get a briefcase which contains a dismantling automatic sniper which can also be used for your needs through the terminal and track what is currently targeting via video signal. The game is homage to retro-futurism, inspired by computer technology from the 80’s. This is also reflected in its retro design with outlined “square” style of graphics, both in people and objects. There is, of course, an unavoidable gramophone that you have in your “base”, and a retro-portable gramophone to carry out on a mission, that’s called “vinylman” which you’ll use to play old hits while playing. All of this gives the game a dose of “hipster” charm, which may not appeal to everyone. The idea and gameplay of the game are very interesting. You’ll really have the feeling that you’re “hacking” something, not like in modern games that are conducted with logic “press x to hack” (Watchdogs, I am looking at you). The problem is that the levels are somewhat simple and rudimentary. Which, to a certain extent, fits the premise that the game wants to convey, and which is outlined on purpose – that you’re in a simulated environment, with all the elements of the level marked. You have a feeling that you’re in a “blueprint” of some game’s level designer. In addition, the game is not fully using the potential of its gameplay. As fast as it introduces new elements such as additional gadgets, they are also dismissed right away in the next level. Each level is precisely predefined to complete with a certain logic and gadget, while the next is already designed to use new gadgets for presenting and resolving some new obstacles. To all this must be added the fact that, while entering each level, you get almost precise instructions how to complete it with only a little dose of freedom for you as a player. Is this a deliberate decision of a designer, or were they afraid that people might not know how to manage their game, will remain a mystery. Maybe they had no desire to “offend the players’ intelligence” but they certainly have deprived them that little “freedom” the game offers for research and problem solving. Rather than having “eureka” moments after resolving a certain obstacle or after executing commands of your super solution to complete the level, lukewarm feeling will remain that you somewhat were guided through the level. Every level looks like tutorial for a specific obstacle or gadget. Also, most of the problems you’ll have to solve by using the method of trial & error, because you can’t very well see all the obstacles in a 3D environment at once. All that is mentioned could be a fantastic advantage in a larger and a bit more complex environment. Especially because at the end of the game we gain access to levels that were designed to be played with additional characters, but the game doesn’t support multiplayer. There we saw the outline of what could have been super interesting, but unfortunately was left in the domain of single player. Some levels require you to combine the characteristics of two other hackers, your buddies, who have different abilities in addition to the terminal for hacking. One agile and fast, he can climb over the walls, while other uses tools to open heavy doors or barriers. Among all that was mentioned above, there is a semblance of a story in the game that wasn’t made very clear, or it perhaps deliberately remained incomplete. The secondary characters’ conversations around you are very short and inarticulate. Given that this is a developer and publisher who worked on the title Thirty Flights of Loving, it is totally expected that we get experimental form of narration when the games are in question. The attempts to flirt with the actual player of the game, the attempts to break the “fourth wall”, didn’t go very well in my opinion. The skeleton of the game is excellent, but there’s not enough “meat” to fill up that skeleton with something like that. I’d love to see some enhanced expansion to exploit the full potential of very interesting concepts that were presented here. This “hacker” proof-of-concept has passed, but it’s not for full recommendation, even if it’s an indie title. You will enjoy the beginning, at times you will feel smart and you will want a little bit more of everything, and it’s certainly worth trying at some sale or with a discount, but not at the current price.